Bring your own device (BYOD) has infiltrated the workplace and – despite its benefits – has created a number of issues, especially when it comes to corporate unified communications (UC) strategies. Mixing the unique communications services and interfaces of multiple mobile device operating systems with corporate UC systems can be quite a challenge. 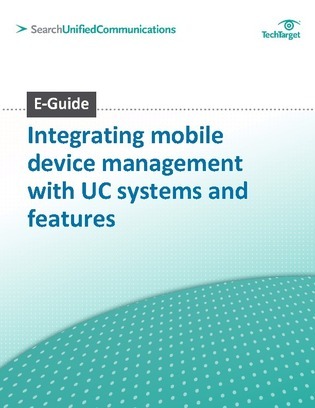 Check out this E-Guide from SearchUnifiedCommunications.com to uncover steps you should take to successfully integrate mobile device management (MDM) with your UC systems and features to ensure the success of both initiatives. By hitting View Now, I authorize Sprint to contact me by phone and/or email with offers and promotions.